TCROSS NEWS and its global partner, Angioplasty.Org, visited Shimadzu Corporation, a major Japanese company founded in 1875, to learn about its plans for future overseas business development of its angiography systems. 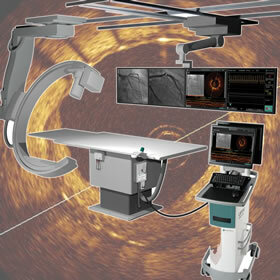 We saw demonstrations of the Trinias Angiography System, the SCORE StentView software and more. St. Jude Medical (NYSE:STJ) recently announced that it has launched a mobile version of its OPTIS™ Integrated System in Japan and Europe. Like its built-in console cousin, the new system, dubbed OPTIS Mobile System, brings together optical coherence tomography (OCT), fractional flow reserve (FFR) and standard angiography. At the American College of Cardiology (ACC) Annual Scientific Sessions in San Diego, results from the keenly anticipated PROMISE clinical trial confirmed what many cardiologists and radiologists have long suspected to be true: coronary computed tomographic angiography (coronary CTA) is extraordinarily effective in accurately diagnosing patients with low to moderate chest pain. In most cases, coronary CTA is at least as effective as diagnostic methods such as stress tests such as SPECT myocardial perfusion imaging. Consumer Reports regularly publishes health information to aid the consumer/patient in making decisions. And that's a good thing. But also important is having the most current information, which their January 27, 2015 article, titled "The surprising dangers of CT scans and X-rays," does not. I'm talking about the radiation dose from a Cardiac CT scan. The article states that a Cardiac CT Angiogram (CTA) exposes the patient to 12 mSv of ionizing radiation, or 120 times that of a chest X-ray. This was true years ago, when CTA was first being used to diagnose coronary artery disease. But it is not true today. The Society of Cardiovascular Computed Tomography (SCCT) Board of Trustees today announced that Norm Linsky, MPA, MA has been selected as the Society's new Executive Director. Linsky comes to SCCT from the Society for Cardiovascular Angiography and Interventions (SCAI), where as Executive Director for 14 years he partnered with physician volunteers to dramatically increase SCAI's membership, educational programs, advocacy efforts, guidelines and international partnerships. Commentary from the Editor's Blog: The acquisition of Volcano by Philips is a landmark event in the world of imaging. For years, Volcano's mantra was "angiography alone is not enough." Well now, angiography agrees and one of the largest manufacturers of cath labs will be offering IVUS, FFR and iFR modalities as part of its total imaging package. The potential spread of these technologies can only benefit patients, with better outcomes and more targeted procedures, and also save hospitals and healthcare systems money. Is Radioactive Isotope Shortage an Opportunity for CT Scans to Shine? Volcano's Virtual Histology Imaging Allows Major Drug Study (IBIS-2) to Measure "Vulnerable Plaque"
First Toshiba Aplio XG Ultrasound Installed at Largest Outpatient Imaging Practice in U.S.
Volcano Corporation today announced the signing of a distribution agreement with Johnson & Johnson K.K., Medical Company.The agreement appoints Cordis Endovascular Systems Japan as a distributor of IVUS products for use in peripheral and endovascular procedures in Japan. “The planning tools available on our Infinix product line improve the visualization of bone and vessels to assist in surgical planning and enhance the accuracy of interventional procedures – ultimately delivering better care to the patient,” said Robert Micer, director, X-ray Vascular Business Unit, Toshiba. “The latest upgrades to the Infinix-i series demonstrate Toshiba’s long-term commitment to innovation and extending imaging capabilities to further clinical value.”. The company announced it will demonstrate two of its state-of-the-art X-ray systems featuring digital radiography (DR) technology at this year’s RSNA annual meeting. As part of the demonstration, Toshiba will display its innovative DR technologies, including the popular T.Rad-PLUS™ Digital and Kalare™ systems. Both systems utilize a removable DR panel and allow clinicians the flexibility to obtain images from virtually any position without moving the patient. The enhancements improve patient comfort and result in faster exams – supporting today’s imaging needs by handling ambulatory, wheel chair and stretcher patients.. Enhancements for Toshiba's Aquilion™ CT systems include a new V3 software release on the CT console that enables faster scanning and data analysis, resulting in improved efficiency and more accurate diagnoses. 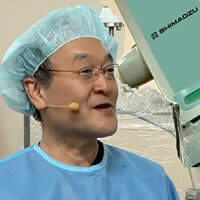 Toshiba also is demonstrating the new Automated PhaseXact™ software (an additional component of the SURECardio™ package) that automatically locates the optimal phase of the heartbeat assuring the best image quality, decreasing image reconstruction time by at least 50 percent and reducing storage requirements. Advanced rendering and analysis in seconds is now possible with V3’s enhanced DICOM data transfers. This new option enables data transfer at up to 60 images-per-second. At the heart of the Infinix VFi/BP system is a versatile multi-axis floor-mounted positioner with a 12” x 16” flat panel detector (FPD) that allows unprecedented clinician access and anatomical coverage of the patient. In combination with an 8” x 8'' FPD on a ceiling suspended omega C-arm, the FPDs deliver high-quality, distortion-free images needed for complex vascular and neuro interventional, and general angiographic procedures. Toshiba’s e-Learning site is open to all healthcare professionals. Toshiba customers now can register online, at their convenience, for courses at the Toshiba Education Center in Irvine, Calif., giving them the opportunity to schedule training that best suits their busy schedules. Additionally, technologists being cross trained on Toshiba systems will be able to complete preparation guides in advance of their onsite training in Irvine, ensuring that the time spent at the Center is used to maximum efficiency. Customers, as well as those not currently using Toshiba systems, also will have access to an extensive catalog of courses, including principles of diagnostic imaging courses in CT, MR, vascular, cardiology, anatomy and medical ethics. Continuing Education (CE) and Continuing Medical Education (CME) credits can be issued for these courses. The Vantage Atlas Plus’ unique elliptical large bore design will decrease incidents of claustrophobia, giving patients more room during an MRI exam. The system also provides an expanded field-of-view (FOV) at up to 55cm – allowing clinicians to capture high-quality images across the entire bore. Toshiba America Medical Systems, Inc. today announced the company’s newest innovations for its Aplio™ ultrasound system, including new 4D technology, which allows users to acquire volume data sets for subsequent, off-line review. The Aplio XG’s 3D multi-slice view delivers sequential imaging with a presentation format similar to CT and MR.
Toshiba America Medical Systems, Inc. today announced it will preview its first 3-Tesla (3T) magnetic resonance (MR) system as a works-in-progress at the Radiological Society of North America’s (RSNA) annual meeting in Chicago. Developed based on the popular EXCELART Vantage™ platform, the new 3T system boasts a revolutionary new magnet design and short-bore combination. Toshiba America Medical Systems, Inc. today announced that it will install the first U.S. site beta 256-slice Computed Tomography (CT) scanner at The Johns Hopkins University School of Medicine and its Heart Institute in February 2007. Johns Hopkins will test the beta system for its value in early assessment of critical radiology and cardiac CT protocols. The beta system will be at Hopkins for a limited time to acquire data to further clinical research and product development. Toshiba’s 256-slice works-in-progress CT is designed to acquire a large volume of data that can cover the brain or heart in a single rotation. The system’s volume acquisition provides more accurate images and lowers dose, resulting in more accurate, quicker diagnoses. Additionally, dynamic multiple phase studies such as perfusion of the brain, heart or other organs are possible. As part of an ongoing partnership to deliver turnkey picture archiving and communications systems (PACS) solutions to the medical community, Toshiba America Medical Systems, Inc. and McKesson Corporation today introduced the Horizon Medical Imaging™ Store 100, a cost-effective mini-PACS solution, exclusively available for Toshiba products, which will enable smaller hospitals and imaging centers that don’t need an enterprise PACS system to store data in a manageable and cost-effective way. Toshiba America Medical Systems, Inc. today announced that the Food and Drug Administration has cleared for market its new EXCELART Vantage™ powered by Atlas 1.5T magnetic resonance imaging (MRI) system. The Vantage Atlas 1.5T MRI system features a complete redesign of the system. The new 128-element system will meet clinical demands for an MRI system that delivers high-resolution images across the entire body with faster imaging times, rendering quick and accurate diagnosis, and will increase patient comfort. Demonstrating the ability of Toshiba's Aquilion LB (Large Bore) CT scanner to iamge vedry large objects, Lockheed Martin is utilizing the scanner to ensure the integrity and reliability of aircraft parts. Furthering the availability of training for Cardiac CT, Toshiba America Medical Systems, Inc. announced a new partnership with CVCTA Education and San Francisco Advanced Medical Imaging, a Liberty Pacific Medical Imaging Company, to serve as the company's newest education and training partner. Recently, LPMI's San Francisco Advanced Medical Imaging installed Toshiba's Aquilion™ 64 CFX system — one of the most advanced cardiac computed tomography (CT) systems available in the marketplace today and the cornerstone of the program. As part of its ongoing commitment to customer training, Toshiba America Medical Systems, Inc. today announced the grand opening of the Toshiba Education Center. The center, a $6 million, 4,840 square-foot expansion to the Toshiba Training Academy, provides a full complement of state-of-the-art classrooms and labs equipped with Toshiba’s advanced CT, MR and Vascular products, including the Aquilion™, Vantage and Infinix™ systems. The nation’s premier site for pediatric radiology - Cincinnati Children’s Hospital Medical Center - has selected an Aquilion™ 64 CFX from Toshiba America Medical Systems, Inc. to strengthen its position as a provider of patient-friendly imaging technology and improve evaluation and treatment capabilities for its pediatric patients. The Aquilion 64 CFX was chosen based on several factors, including the system’s scanning speed, radiation dose profile, and expanded cardiac capabilities. In this new role, Micer will be responsible for implementing tactical and strategic marketing plans for a business segment that helps to drive overall growth and profitability for the company. This key Toshiba leadership position is responsible for interfacing with Toshiba's global business unit in Japan to effectively communicate the needs and requirements of the U.S. markets. Multislice CT scanning is now making inroads in the emergency room as a tool to quickly screen patients presenting with chest pain and eliminating non-cardiac causes with great accuracy. In this blinded study, CT scanning had a 100% negative predictive value, meaning that 100% of all patients who were having non-heart-related chest pains -- and were not suffering from acute coronary syndrome (ACS) -- were identified. The company announced in a press release today that it has received Food and Drug Administration (FDA) clearance for a new CAN Level 1 injector synchronization option for its Aquilion™ 64- and 32-slice computed tomography (CT) systems. The new option facilitates contrast enhanced CT exams by interfacing the CT scanner to a contrast injection system – giving clinicians the option to activate the contrast and the scanner without leaving the patient's side. The companies initially plan to develop Guided IVUS (GIVUS), a product which will integrate MediGuide's Medical Positioning System (MPS) with Volcano's intravascular ultrasound (IVUS) system. This combination of technologies will expand the two dimensional aspect of the existing IVUS image into a three dimensional image that is designed to provide more useful clinical information, allow for easier interpretation of the image by interventional cardiologists and improve the clinical utility of the image. In March, Toshiba's Aquilion 64-slice CT system ranked top in overall vendor ratings in the KLAS study. Now its MRI system has achieved a similar distinction. The company today announced the first permanent installations of the s5i IVUS (intravascular ultrasound) imaging system in both the U.S. and Europe. The s5i is Volcano's first IVUS system that can be integrated into any new or existing cath lab configuration. Through a series of customizable components, Volcano can now tailor an integrated IVUS solution to the unique user and workflow needs for any vendor's cath lab type or configuration. A long-awaited Scientific Statement on the value and use of coronary calcium scoring was released by the American Heart Association. The document represents a consensus view on which patients are best candidates for getting calcium scoring CT exams. The company announces new software for their current state-of-the-art 64-slice CT scanner that will "deliver one of the industry's fastest 'data to diagnosis' solutions and advanced workflow improvements that increase productivity and help make departments more efficient." 64-slice CT scanners generate vast amounts of data that needs to be processed before a meaningful image can be viewed. With the increasing use of multislice CT scanners in ER and Trauma Centers, speed of diagnosis is critical. FEATURE: Will Multislice CT Angiography Replace Catheterization? The company today announced the availability of a new upgrade for the popular Nemio™ ultrasound system. Using next-generation technology, the Nemio XG provides the image quality needed to render a fast, accurate diagnosis – limiting the number of patients who are referred for more serious procedures, testing and follow up. McKesson announced that it has signed a distribution agreement with Toshiba America Medical Systems, Inc. The agreement calls for Toshiba to offer McKesson's No. 1 ranked Horizon Medical Imaging™ PACS solution with Toshiba's innovative diagnostic imaging devices, including the Aquilion™ line of CT scanners. The agreement is designed to offer imaging centers and hospitals under 200 beds a turnkey solution that's affordable, easy to implement and easy to support. In a joint statement, McKesson and Toshiba noted that they believe this agreement is the best way to offer the community market affordable, easily installed best-of-breed diagnostic imaging solutions. This feature article covers a wide range of topics concerning the rapidly growing use of 64-slice CT scans to diagnose coronary artery disease, a subject not without controversy. The article states an oft-quoted fact, that one-third of all diagnostic cardiac catheterizations (angiograms) turn out to be normal. Most current studies of Multislice CT scans show a negative predictive value in the high 90's (the patient does not have significant disease) -- at a cost that 10% of a standard angiogram and non-invasive. Toshiba's new system, introduced in March, is the only single lab that meets American College of Cardiology guidelines for both cardiac and peripheral work. The availability of this system and its adoption reflects the growing trend in medicine toward treating vascular disease as an entity, whether heart-related (coronary artery disease) or in the peripheral circulation (legs, kidney, etc.) -- many patients who have vascular disease in one area often have it elsewhere. According to Dr. James Burke, director, cardiac catheterization laboratories and interventional cardiology at Temple University Hospital in Philadelphia, "With our patients as our top priority, we chose Toshiba's Infinix DP-i/FD2 because it was clear that the technology would enable us to improve our diagnosis and treatment capabilities.... We can diagnose and treat all of the cardiac and vascular problems in our patients without compromising either area. This is the future of comprehensive cardiovascular care." Toshiba's Technology Contributions Featured on Top Morning Talk Show "Live With Regis and Kelly"
Toshiba Medical and other Toshiba divisions have donated over $80,000 worth of ultrasound and other equipment to Partners for Healing clinic (PFH) which serves an uninsured community in Tullahoma, Tennessee, as part of “Live with Regis and Kelly’s” 16th annual “Mom’s Dream Come True” Mother's Day special. The company has now enrolled more than 2,500 cardiologists and radiologists in its education and training programs to help expand the knowledge base among medical professionals regarding the latest diagnostic imaging modalities, and 64-slice CT technology in particular. In their press release, Toshiba states that this is "a significant milestone for the company’s CT business, which has installed more than 17,000 CT systems in hospitals, imaging centers and medical group practices worldwide, including the Johns Hopkins University School of Medicine, Beth Israel Deaconess Medical Center, Shands at the University of Florida and Cardiovascular Institute of the South (CIS). According to Peter S. Fail, M.D., cardiologist, CIS, growing patient awareness about advances in diagnostic imaging and physician demand for cutting edge imaging technologies has encouraged many healthcare facilities to acquire 64-slice CT systems to remain competitive and better serve patients." The company has named diagnostic imaging industry veteran, Lawrence Dentice, general manager, senior vice president and an officer of the company. Dentice has been Toshiba’s vice president, sales, since he joined the company in 2002. Former general manager, Edwin Lodgek, has left the company. Toshiba America Medical Systems Becomes American College of Cardiology Foundation "Imaging Champion"
Toshiba has announced major support of a series of educational programs presented over the next year by the American College of Cardiology Foundation that will bring together clinical experts in ultrasound, nuclear cardiology, angiography, computed tomography and magnetic resonance imaging to present the current state-of-the-art in imaging and update medical professionals in the field. Of note is the inclusion of Cardiac CT for the first time in several of the programs, indicating the growing interest in this imaging modality. The company announces installation of its latest flat panel detector vascular and cardiac imaging system in Parma (Ohio) Community Hospital. A company spokesperson says, "The Infinix CC-i FPD is uniquely designed to meet the select needs of clinicians conducting complex cardiac imaging procedures. In addition to the system’s unparalleled image quality and lower dose, it improves diagnosis and treatment while maintaining patient safety." In this press release, the company announces installation of five new catheterization labs in this Kalamazoo Michigan hospital, in addition to the existing Aquilion CT scanner. "According to Tim Fischell, M.D., director of cardiac research at the Borgess Heart Center for Excellence, incorporating diagnostic imaging into the center’s practice has dramatically improved the level of cardiac care they are able to deliver to patients. “CVD continues to be a major problem in our communities, and advances in diagnostic imaging have had a significant impact in diagnosing disease of the heart at its earliest stages and preventing death.” Dr. Fischell is the co-inventor of the BX Velocity stent, which forms the foundation of Cordis' Cypher drug-eluting stent. Developed in Japan by Toshiba Medical, this experimental CT multislice scanner was able to image the entire heart in a single heartbeat in 1.5 seconds. The survey included more than 300 healthcare professionals, including imaging directors and managers, C-level executives and physicians on survey categories, including service; ability to deliver product; upgrade path; scanner reliability; end- user presentation; cost and value; technology and architecture; post-processing capabilities; and PACS (picture archiving and communication systems) integration. In addition to Toshiba’s top distinction in overall vendor ratings, the survey revealed that Toshiba scored highest in four categories, including cost and value, technology and architecture, post processing capabilities, and integration into existing PACS solutions. This feature, about a community hospital in Redwood City, discusses the benefits of the new 64-slice CT scan technology. Story about a 62-year-old California man who volunteered for a test of a new 64-slice CT scanner at Kaiser Permanente. Although he had no history, indications or symptoms of heart disease, the scan revealed extensive blockage in one of his coronary arteries. The blockage was addressed later with a stent. As multislice CT angiography becomes more widespread, regional centers of excellence are springing up -- hospitals or imaging centers where physicians can go to attend training. This press release announces that Toshiba has teamed up with CIS in south Louisiana to provide training in CT angiography. Is cardiac CT scanning an alternative to cardiac catheterization for screening patients? This article from a local Delaware paper speaks to some physicians about this growing imaging technology, known as MultiSlice Computed Tomography or MSCT. When less is more -- a study of the radiation dose from a new prototype 256-slice CT scanner was compared to that of a third generation 16-slice scanner. One would think the radiation dose would be higher with the higher resolution 256-slice unit, but just the opposite was true. The authors attribute this to the fact that the 256-slice scanner is able to image a large area at once, whereas the 16-slice system took multiple scans that had to include a slight overlap. Thus the total radiation exposure for the given studies was greater in the 16-slice scanner.